When I picked up Tomb Raider for the first time, I hadn’t read any reviews on it, I just knew that it was a reboot of the franchise and that the cover art looked awesome. I was expecting a pretty average platforming/puzzle solving game with a bit of action mixed in, based on what I had heard about the previous titles in the series. Man, was I wrong. Tomb Raider starts off with a brief cinematic introduction showing Lara, the player character, on a ship. In typical adventure game fashion, the situation soon goes south and the ship is wrecked off the coast of an island. Lara manages to swim to shore, but is knocked unconscious by a mysterious figure as she tries to call her friends for help. 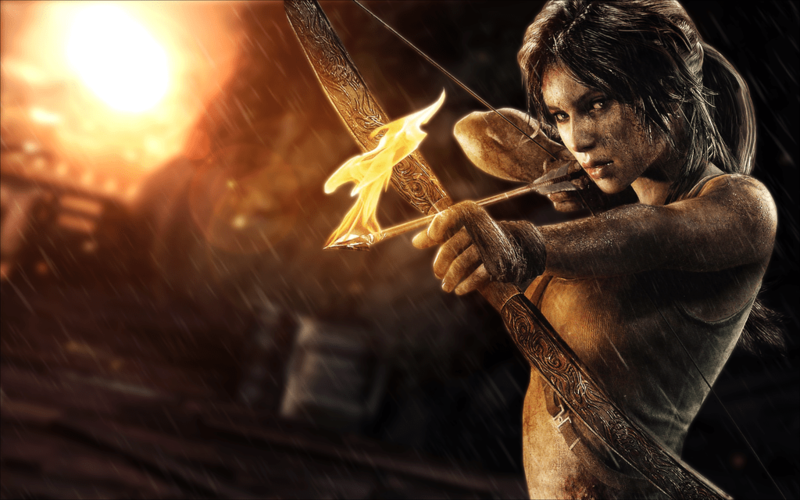 The game does an excellent job with it’s early pacing, with Lara not involved in any direct combat for quite a while to emphasize her innocence at the beginning of the story. When she is eventually forced to kill someone is has a huge impact on her, and I think the development team did a great job in portraying the rather naive side of her first before showing her transition to the typical action heroine as it does add at least a little depth to the character, even if it isn’t on the level of character development contained in works like ‘The Last of Us’. The combat system is fairly bland, though I actually enjoyed the way counterattacking is handled, with the player first needing to dodge the enemy’s attack and then having to time a second button press well to perform the actual counter attack. Other than that it is pretty standard cover based gun play for the most part, but stealthy gameplay is heavily rewarded. Some areas are almost too easy if you take the stealthy route, but most of the time it takes a decent level of skill to clear an entire level without raising the alarm. Being able to create distractions by shooting arrows into walls and rocks near enemies is a nice touch. There are five weapons in the game, and each is heavily upgradable, though I found the system to be more of a choice of which weapon to upgrade first rather than having to choose between having a really strong bow or a really strong assault rifle. I suppose it’s an okay system, but it doesn’t really seem to fit the theme of survival and scavenging. Another nice point is that the cover isn’t ‘sticky cover’ like in games such as Gears of War. Rather, Lara will just seamlessly duck into cover as she moves past appropriate terrain, which results in much smoother and realistic movement. For the veterans, there was still a fair amount of puzzle solving gameplay in the form of tombs, though they are mostly, if not all, optional (I played all of them all and didn’t take note at the time, but from what I’ve hear they were all made optional to cater for people who weren’t interested in that type of gameplay). Some of the tombs were decently challenging, though I wouldn’t use the ‘survival instincts’ mode (similar to the eagle vision in Assassins Creed; it highlights objectives and gives you visual hints by highlighting other crucial objects) while completing them if you are hoping for a decent challenge. The theme of the tombs also fits well with the rest of the story. Your reward for completing them is usually a decent chunk of salvage (used in weapon upgrades) as well as a ‘treasure map’ which displays all of a certain type of collectible in the area on your map, so you aren’t forced to complete the tombs at all. Tomb Raider uses an interesting ‘Diary’ system that allows you to understand the characters better. Lara’s diary entries are unlocked gradually as you play through the game, and are used as both a secondary system of character development as well as summarising the plot at various key points. I think this is a great system to allow players who may be distracted during a particular section of play to catch up on what they missed. 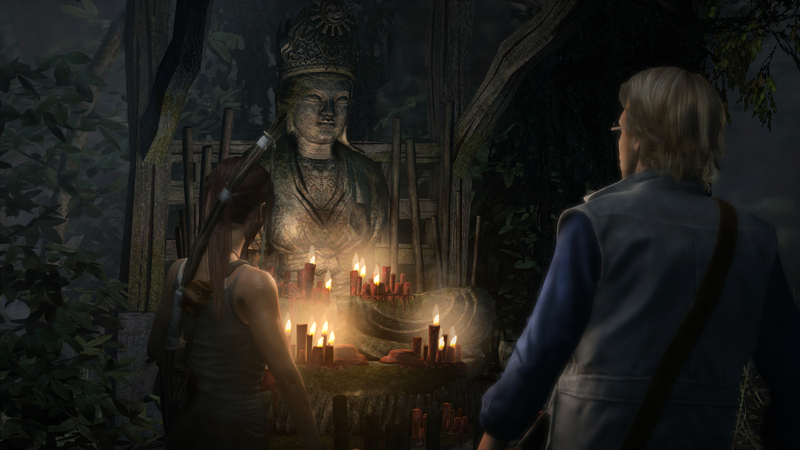 You can also find various diary entries written by the other characters which give each of them a little bit of depth, though they are still mostly just two dimensional props to be used in Lara’s adventure. The plot is centered around the real-world ancient Japanese civilization ‘Yamatai’ and it’s ruler, Himiko, the Sun Queen. I found it interesting enough, and the relic system is great for adding a bit of flavor to the environment. Unfortunately, I did encounter a couple of bugs and graphical glitches in my time with the game. For example, when I was playing through the DLC tomb ‘Tomb of the Lost Adventurer’ I got to a point where my survival instincts seemed to indicate that I had to jump on a certain platform, however, when I jumped for it, I was only able to hold on to the ledge and hang unless I shifted right to the end of the ledge. I then attempted to pull myself up, which caused me to lose control while Lara slowly slid backwards off the ledge. I decided to just ignore the tomb, as it hardly seemed vital to the experience. In the end, nothing gamebreaking, but irritating nonetheless. I had a great time with Tomb Raider. As a newcomer to the series, I can’t really comment on how it compares to the other games, particularly with regards to the puzzle solving element. The plot and character development was decent, though everyone besides Lara were clearly just the supporting act. The game felt smooth and responsive for the most part, and the few bugs that I encountered weren’t enough to sour the experience. Overall, I would give it an 8.5/10.